PanARMENIAN.Net - Ameriabank is entering into EUR 16.8M long-term subordinated loan agreements with several funds managed by responsAbility Investments including the Global Climate Partnership Fund (GCPF) as well as funds focusing on micro- and SME finance. 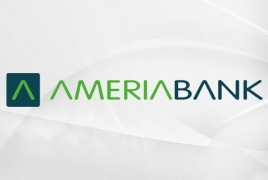 The new long-term facilities enable Ameriabank to strengthen its capital, therefore making sufficient buffer to finance Armenian businesses and green energy projects. The facilities will have significant development impact through long-term funding and further loan portfolio growth – noted Artak Hanesyan, CEO of Ameriabank - we highly value this new level of partnership with our long standing partners. The use of funds will better serve the interests of our clients in various industries and facilitate further development of the Armenian economy”.